Goda means sweet in Marathi and kala means black. This sweet, smoky spice mix is among the most complex ones you will find in Indian cooking. It is a spice mix made without garlic and onions and is most often attributed to the cooking of the Pune Brahmins but is not limited to this community. It has dozens of ingredients but it is worth the effort because you can use it in so many dishes and refrigerated it will keep for over a year. Goda masala is added to a long list of dishes: usals, stuffed aubergines, vaangi bhaat and amti. Goda is also called Kaala masala because of its dark bronze color but there are other versions of Kaala masala in Maharashtra with varied spice combinations but they all contain dagadphool. Sholapur and the Khandesh have unique Kala masalas- you will find the recipe here. http://www.taradeshpande.in/khandeshi-kala-masala/ . Unlike other spice mixes, that require a light toasting, spices for goda masala are individually roasted slowly, till they are golden brown, to produce a dark colour- hence the name Kaala masala- the final color is not a light brown but a deep dark brown and mildly sweet because of the addition of coconut. 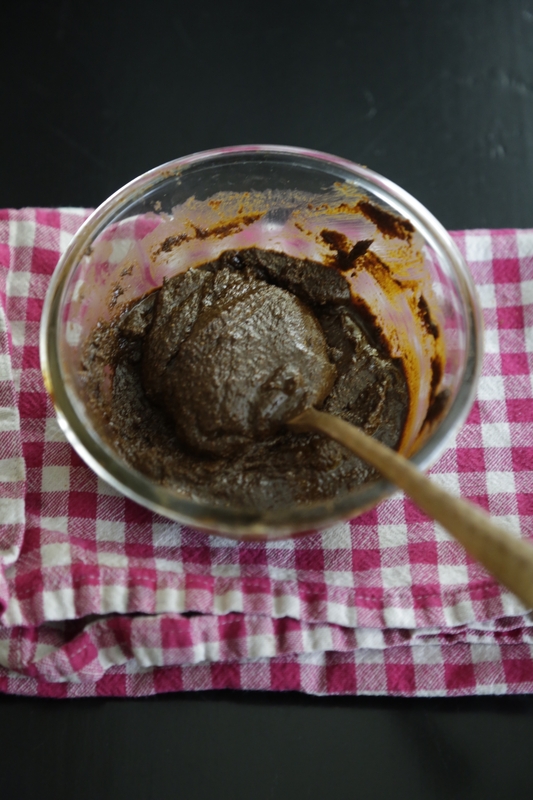 Commercially sold Kaala or Goda masala is generally a drier powdered mix. The one we make at home is not. Its sticky and clumpy because of the oils released while grinding the coconut and sesame seeds. Do not heat the oil before adding the spices. Add cold oil to the spices in the skillet and cook on low to medium heat. Keep stirring to avoid burning the spices. You can halve this recipe to make a smaller amount. Put a heavy bottomed large cast iron skillet or pot on low heat. Add the coconut to the dry skillet and roast until the coconut is golden brown. This will take a good 7-10 minutes. Do not burn the coconut. It should be a light brown when you take it off the stove. Reserve in a medium- sized mixing bowl. Stir in turmeric and reserve. Add the cumin and mustard seeds to the same skillet. Roast for about 3 minutes, till fragrant and golden. Add a teaspoon of oil and continue roasting. Remove and scrape into a medium-sized mixing bowl. Add coriander seeds and b lack cumin to the same skillet and roast 2-3 minutes. Add 1/2 teaspoon oil and count roasting until golden brown. Remove and add to the bowl of coconut. Add the cloves, cinnamon and stone flower. Roast for 2 minutes.Add 1/2 teaspoon oil and roast again until fragrant. Scrape into the same bowl. Add the red chillies, bay leaf and black cardamom and roast on low to medium heat for about 2 minutes. Add 1/2 teaspoon oil and roast again. Scrape into the bowl. Add the sesame seeds and fenugreek seeds and continue toasting for about 4-5 minutes, till the seeds are golden. Add 1/2 tsp oil and roast again. Add to the bowl. Add a teaspoon of oil and the asafoetida at the same time and roast until fragrant. Scrape into the bowl. Combine all the spices and the coconut with a spoon. Return all of them to the skillet and roast again, turning continuously for about 2 minutes. Switch off flame and continue to stir to dissipate heat. Then cool in the mixing bowl. When spices are completely cool grind in small batches to a smooth fingerless powder. Then grind all the batches together again. At this time you can add salt if you like. You will have a bronze color spice mix thats wet and clumpy. Cool them and grind to a slightly wet powder. Store in the refrigerator in an airtight container. This spice mix, if kept moisture-free, will last a year in the refrigerator. Scrape of spoon fulls as as when required and return to the fridge. While this is a great dipping sauce for sushi, tempura and sashimi I also use it as a marinade and a salad dressing -options are given below. 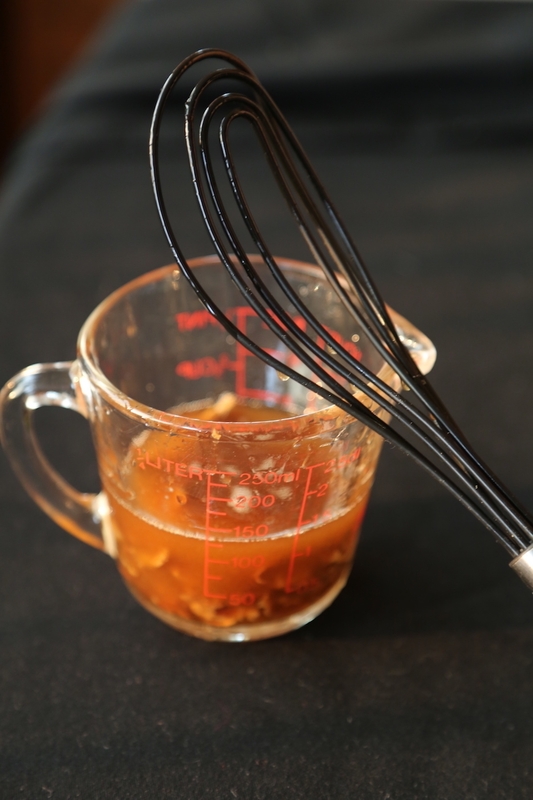 Place the mirin in a saucepan over medium heat, add the shoyu and bring it to a gentle boil. Switch off the flame and then add the fish flakes. Let it rest until it reaches room temperature. Whisk it again. Strain the shoyu through a fine strainer. Bottle and refrigerate for up to 6 months. Scan be served chilled from the fridge as well as at room temperature but whisk it before use. Combine half cup Tsukejoyu with 1/4 cup vegetable oil and 2 tbsp toasted sesame oil, 1 tsp toasted white sesame seeds and juice of one lemon, 1/2 tsp or. more ground wasabi paste. Drizzle over cucumber, tomato and lettuce salad. Combine 3/4 cup Tsukejoyu with 1/4 cup crunchy peanut butter, 2 tsp finely minced garlic, 1/2 cup finely chopped scallions, 1 tbsp red pepper hot sauce of your choice. Adjust for sweetness with brown sugar and toss with 200 grams of noodle salad. Combine 1 cup Tsukejoyu with 1 tbsp ground ginger root paste, 1/2 tbsp fermented red chilli paste, 1 cup good quality orange juice, 1 teaspoon orange zest and salt to taste. Pour over 750 grams of chicken, fish or pork and marinate overnight. Grill or roast the meat as desired. Thicken the leftover marinade with some corn starch and serve with the cook meat. Mille is a thousand in French and this classic dessert is a cake made with many crepes.It is a showstopper guaranteed to impress. Prepare the batter and the pastry cream the day before. Assemble the crepes the day you want to serve the dessert at least 8 hours before you serve it. You can do this dessert with fruit compote, white chocolate ganache or no topping at all, you could use an almond paste instead of Nutella- there are so many combinations. You can garnish the top with fruit, shaved chocolate even edible sugar craft. Traditionally it is layered with vanilla pastry cream and topped with powdered sugar. You will need- a fine mesh sieve, ice, cold water, crepe pan, small pouring jug, whisks and a large serving platter for assembly, a large 10-12 inch plate and circles of parchment or wax paper to line each crepe. In a small saucepan, melt and the butter until bubbly and brown. This browned butter will bring depth of flavour to your dessert. Reserve. In another saucepan, boil the milk on a medium flame then cool it about 10 minutes. Stir from time to time to prevent a skin from forming. Using a stand or hand whisk beat the salt, eggs and sugar about 2 minutes. Then add the four cup by cup flour until well incorporated. Do not beat excessively. Then slowly add the brown butter and whisk again. Then stir in the warm but not hot milk. Store this batter in a pouring pitcher or a measuring jug you can use when you have to fry the crepes. Prepare an ice bath- a large bowl filled with ice that you can put the bowl of pastry cream in to chill it. Over the ice place a clean and empty heat proof bowl for the pastry cream and place a fine sieve over it. Boil the milk with the vanilla bean and scraped paste in a small saucepan then strain it through a sieve and discard the vanilla pod-you could reuse it if you are doing another dessert immediately after. In the top pan of a double boiler beat the egg yolks, sugar and cornstarch until smooth then slowly add the the hot milk and combine well. Place pan over the simmering water of the double boiler over high heat and whisking continuously to prevent curdling cook this mixture for 1 to 2 minutes until creamy and thick. Immediately pour through a sieve into the bowl over the ice bath. Using a spatula squeeze the the pastry cream through the sieve into the bowl over the ice. Stir it several times to cool it and prevent a skin from forming. Then whisk in the butter. Let the pastry cream cool about 10 minutes, then wrap tightly with plastic wrap-press the wrap down over the surface of the pastry cream to prevent a skin from forming and refrigerate. Heat the cream in a saucepan until it begins to bubble on medium heat. Switch off the flame and stir in the chocolate until smooth. Cover and reserve. Remove batter from fridge and let sit 25 minutes. Stir it well and if it has thickened add a 1/4 cup of water to it and stir. Prepare a plate and your parchment paper sheets. If you have two large baking trays you can use those instead and line both with parchment paper. Place your 9-inch crepe pan over medium heat. Brush the surface with a teaspoon of oil, then add about 3 tablespoons batter and swirl quickly from side to side to cover the surface. If the pan is too hot the batter will clump. If the batter is too thick it will not spread thinly. The first crepe is the test to gauge your batter. If the batter is too thick add a little more milk. Cook the crepe until the bottom begins to brown, about 1 minute. Slide the crepe by moving the pan to ensure it isn’t stuck anywhere then carefully lift an edge and flip the crepe over with a thin spatula. Cook on the other side for 10 seconds. The crepe must not be mushy because you will have trouble picking it up when you have to assemble the cake. Flip the crepe over onto a baking sheet or plate lined with parchment and let it cool. Repeat until you have 20 round and golden brown crepes. Remove pastry cream from the fridge and stir well. Whip the heavy cream with the tablespoon sugar and the rum. Fold it into the pastry cream. Whip the Nutella. Reserve the best crepes for the bottom and top two layers. Put down 1 crepe on a flat serving plate. Using an icing spatula, completely cover with a thin layer of pastry cream (about 1/4 cup). 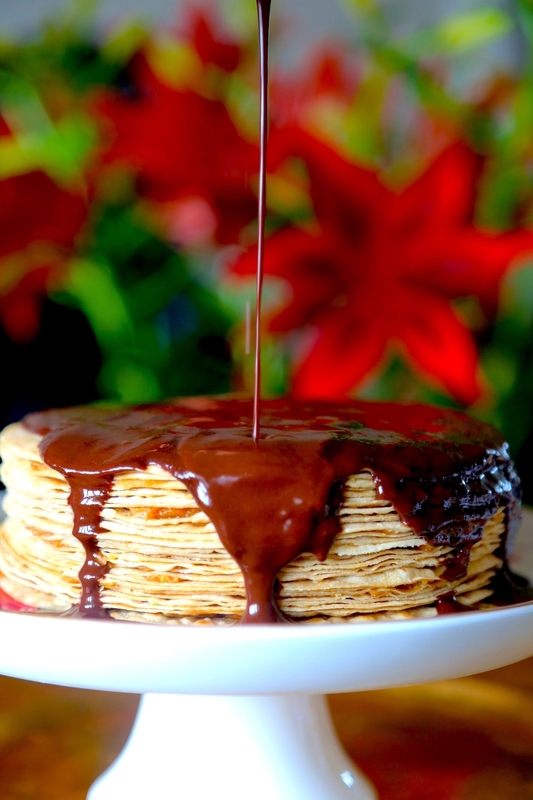 Cover with a crepe and spread with Nutella. Repeat to make a stack of 20, 10 pastry cream and 10 with Nutella. Cover and chill for at least 3 hours. Remove from the fridge and pour the ganache over it. Smooten the top with an icing spatula and allow the rest to drip down over the sides.Garnish with candied hazelnut bits. To serve remove the gateau from the fridge and let sit 30 minutes before you serve it.